> Soil temperatures should be warm and no colder than 6 degrees. > There is plenty of moisture and the weather is neither too cold nor too hot. > There needs to be plenty of time for the germination of seeds to take place before the first severe frost or hot, dry summer weather arrives. 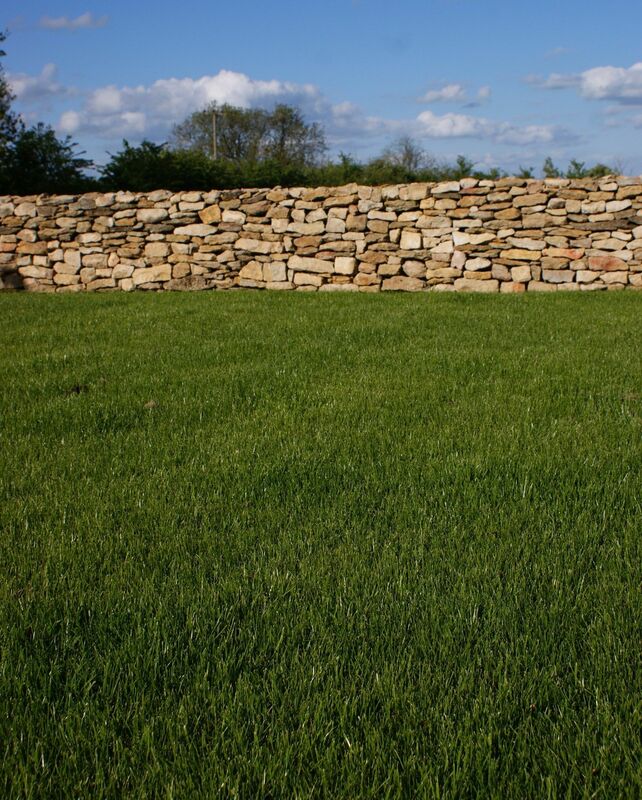 General Purpose Lawn – A mix of hardwearing grasses such as Ryegrass and Fescue would be needed on high traffic areas such as areas that receive a lot of wear and tear from Children and pets. The contents of the Hardwearing seed are 70% Perennial Ryegrass & 30% Strong Creeping Red Fescue. Luxury or Fine Lawn – This would require a mix where by there is not much traffic from children or pets. To achieve a fine in appearance lawn, you would need to look at the contents of the Formal Lawn seed 50% Strong Creeping Red Fescue, 25% Chewings Fescue, 20% Slender Creeping Red Fescue, 5% Browntop Bent. Shady Lawn – These lawns will also require a fine-leafed turfgrass seed the same as the luxury/fine lawn and unfortunately will not be very hardwearing. You will need the same Formal lawns seed for areas that are in light to medium shade, such as under trees and next to fences and hedges. The seeds mentioned above have been treated with Headstart® for faster germination. 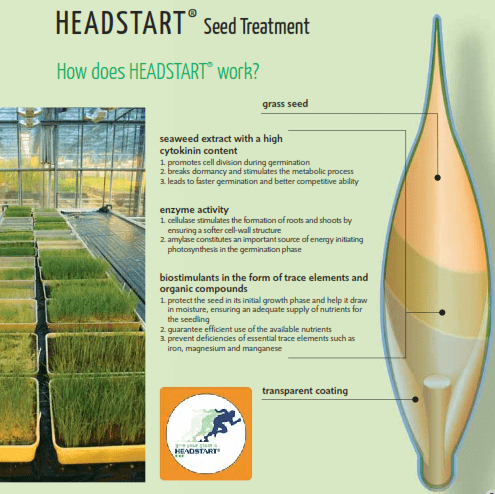 Although more expensive; Headstart® GOLD, is the latest in seed treatment technology for grass seeds. The coating improves performance and ensures maximum germination and establishment so that a healthy well rooted sward can grow. Headstart® GOLD is a further development of the well-recognised HEADSTART® treatment and has been developed using the latest scientific findings and field experience. Each seed has been coated with Seaweed extracts, Bio-stimulants, Molybdenum, Copper, Sulphur & Phosphorus. TOP TIP: Good seed bed preparation is the key to establishing a successful lawn. It pays to give extra attention to clearing weeds and maintaining the surface to a fine cultivation. 2. Dig or rotavate the lawn to a depth of about 20-25cm. 3. It is not essential, however by digging in some well-rotted Organic Farm Manure will hold the moisture in the soil. 4. After cultivation leave the area for around 7-14 days to settle. This will also ensure any weeds that have been sprayed have chance to die before hand removing them if necessary. 5. The area now needs levelling. The best way would be to tread on the area several times in different directions and then rake several times in different directions. 6. Rake in a Pre-seeding Fertiliser at 50g per m2. 7. Sow the correct amount of seed over the area as recommended on the label. 8. Lightly rake over the sown area to cover the majority of seed with soil however take care not to ‘drown’ the seed in soil. 9. If dry weather persists for more than 2-3 days, repeat watering as necessary while the seeds start germinating and becoming established. TOP TIP: Once you have successfully revived your grass, it is important to take the necessary steps to keep up the maintenance over time. 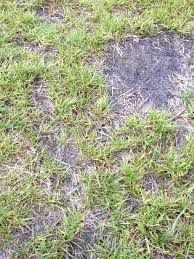 You will need to apply the correct fertiliser for what your grass requires. Using a DIY Soil Analysis Kit can help to reduce buying and applying the wrong fertiliser and spending money unnecessarily. The removal of moss and other debris from the base of the sward will stimulate ryegrass plants to grow, this will help the grass to be better equipped to compete against weeds.